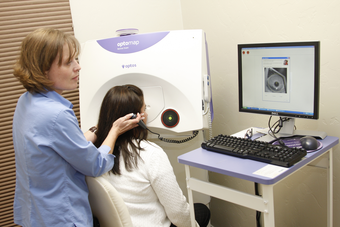 Exam rooms are equipped with this automated version of the manual phoropter (the machine used to determine the glasses prescription). The automated version has several advantages over the manual phoropter: it allows simultaneous presentation of the choices the patient has to make while determining a glasses prescription as well as the ability to compare the patient’s old glasses prescription to a new prescription with just the push of a button. This results in more accurate prescriptions. 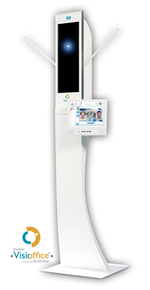 The VisiOffice System is the only computerized, automated measuring system for digital lenses for glasses. This all-in-one system measures the Eye Rotation Center, natural head posture, eye position, visual behavior and frame measurements to be able to manufacture the most precise and individualized lenses ever available. Patients will experience the most naturally precise and effortless vision possible. The Smart System is a remote control digital eye chart capable of producing various vision tests, randomized letter presentation and patient education. 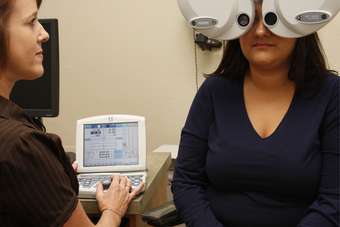 Our exam rooms are equipped with Automated Phoropters (Marco TRS systems). We also use Digital Acuity Charts (M&S). An informative Q&A article with Dr. Bartolleti all about the VisiOffice System, what it is and why it is so significant.